Freelan Oscar Stanley built and opened the Stanley Hotel in 1909. It’s bold architecture is striking against the stunning and scenic backdrop of Colorado’s Rocky Mountains. However, it’s location was strategically chosen to assist Mr. Stanley with a bout of tuberculosis. Fresh air was the main and only form of treatment for the disease at the time. Statue of Freelan Oscar Stanley in front of the Stanley Hotel that he built. 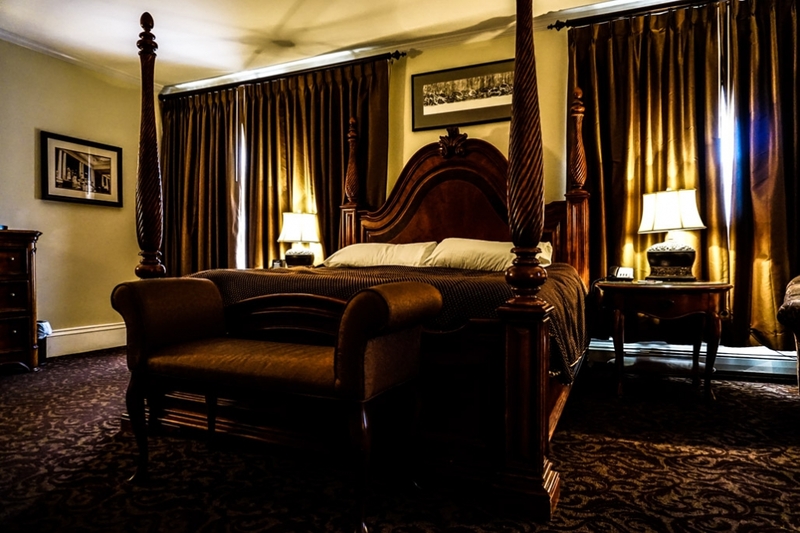 The Stanley Hotel’s most famous and requested room is without a doubt Room 217. 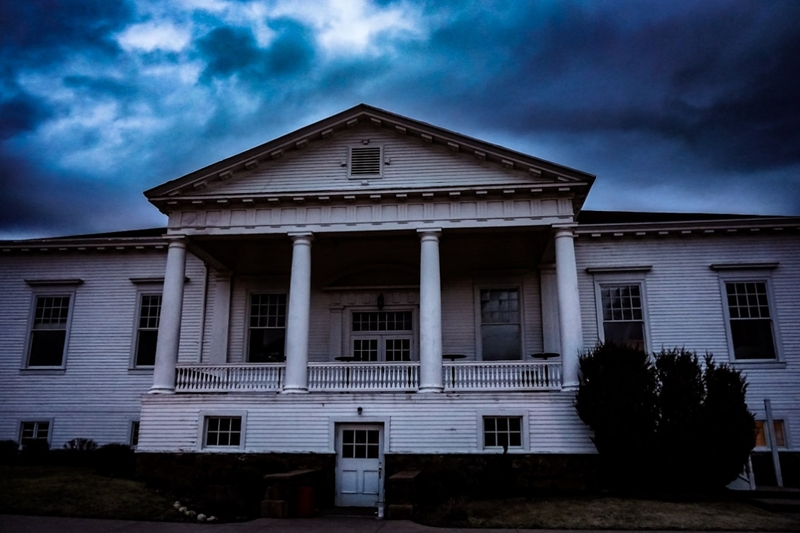 It gained notoriety after famed horror writer, Stephen King, spent the night with his wife at the Stanley Hotel back in 1974. 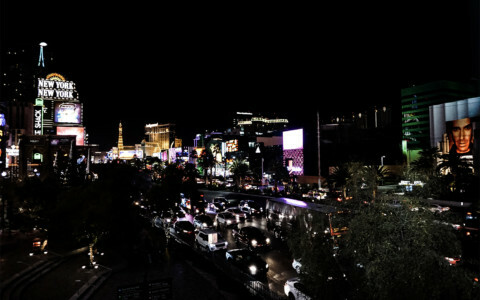 This night would forever change the image of the Hotel. Spending the night inside the Stanley Hotel’s Room 217. King and his wife arrived just before the hotel shut down for the Winter months, but were luckily able to spend the night. They were placed in the presidential suite (#217), being the only room left with clean bedsheets. Since the hotel was in the process of shutting down there were no other guests checked in and the King’s had the entire hotel to themselves. Inside of Room 217 of the Stanley Hotel. After retiring to his room and falling asleep King has a dramatic dream which caused him to wake in fright. He had noticed a fire hose in the hallway just before entering his room and dreamt that his young son was strangled to death by this very object. After waking and feeling quite spooked, King got up for a cigarette. By the time he had finished that cigarette he had the story for his best selling and now movie adapted novel, ‘The Shining’, fleshed out in his head. 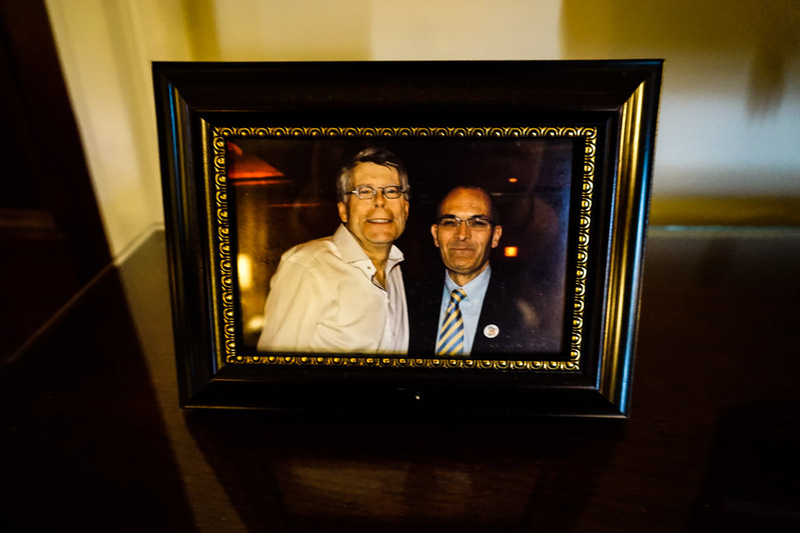 Framed picture of Stephen King inside of Room 217 at the Stanley Hotel. While this legend is often associated with Room 217, it also has its own ghost story. This story begins in 1911 when the Stanley Hotel was powered by gas lighting. During a severe storm this power was lost and a maid was to enter Room 217 to investigate. Elizabeth Wilson caused an explosion upon entering the room with a candle, partly destroying that area of the hotel and sending her crashing through the floor, landing on the floor below and breaking her ankle. Elizabeth survived the explosion and went on to live the rest of her happy and long life. Many now believe that she has returned to the hotel in death and has taken a liking to hanging around Room 217. 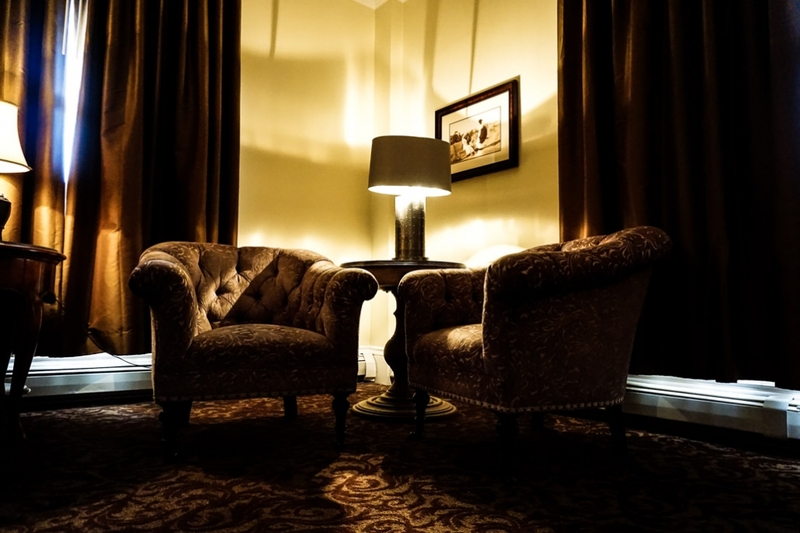 Guests have reported that their belongings will become unpacked during their stay in this room, objects will move around on their own and the disembodied voice of a woman can be heard during the night. 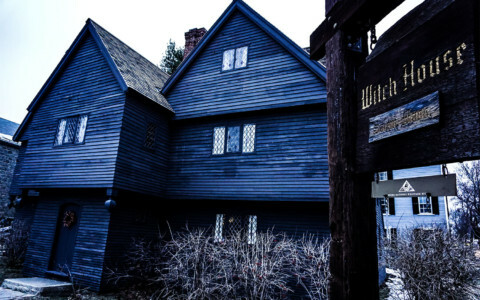 Some have also claimed to see the apparition of Elizabeth walking through Room 217 and exiting straight through a wall, which was once a doorway. 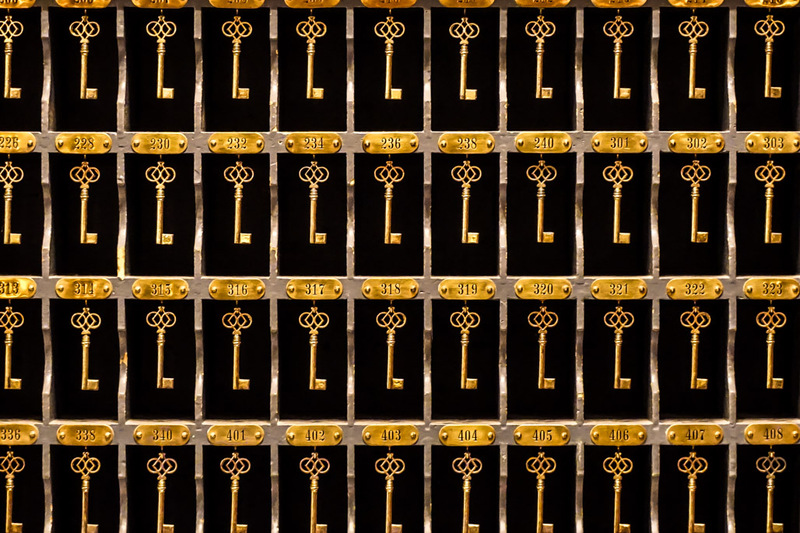 Keys at the front desk of the Stanley Hotel in Estes Park, Colorado. 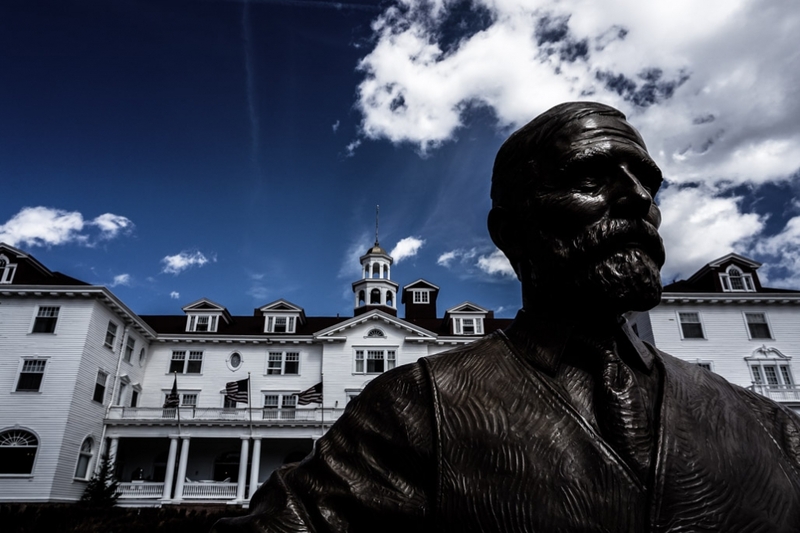 The Stanley Hotel rests on a bed of quartz and limestone, which many believe to be responsible for helping spirits energy remain strong within the building. This is just one theory that attempts to explain the high instances of paranormal activity within the haunted Stanley Hotel. Decor adorning the grand staircase of the Stanley Hotel. The Stanley’s are thought to still linger within the hotel that they built. Freelan Oscar Stanley has been sighted all throughout the hotel, yet is most frequently seen inside the hotel’s bar. Many of the staff believe that he is still looking after operations of his hotel and they claim to be able to feel his presence around them. Freelan’s wife, Flora, was an avid musician during life and some say she continues her hobby of playing the piano at the hotel. Phantom sounds of piano music when nobody is around have been reported from both the Music Room and the Concert Hall at the Stanley Hotel. The Stanley Hotel’s whiskey bar. 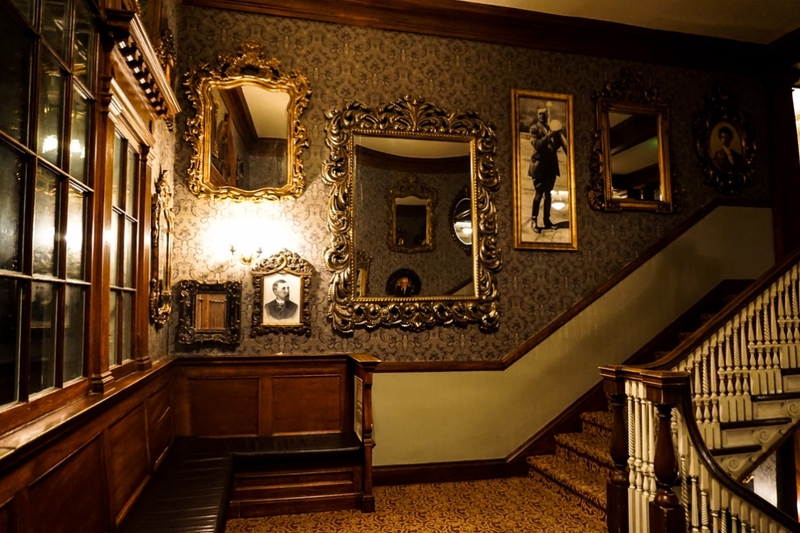 A favorite spot for capturing apparitions within photos is the grand staircase of the Stanley Hotel, which proudly greets guests as they walk through the front doors. Several photos of a woman dressed in turn of the century garb on the stairs have been captured here. Ascending the grand staircase in the lobby of the haunted Stanley Hotel. The fourth floor is said to be the most haunted within the Stanley Hotel. This area was once where the maid’s quarters were located and it is thought that many of their children still reside in that area. 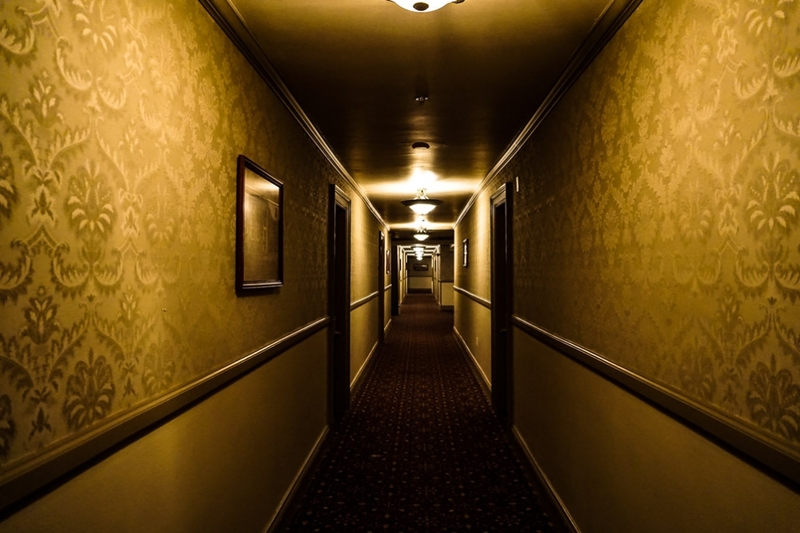 The ghostly sounds of children playing, giggling and running up and down the hallways are frequently reported by guests, even when living children are not around. Notably haunted rooms include 401, which is supposedly haunted by Lord Dunraven (former owner of the land) and features a closet that opens and closes on its own accord. Room 428 is also a paranormal hotspot, having furniture which moves around by itself and the ghost of a cowboy who watches you sleeping from the foot of the bed. Looking down a hallway of the haunted fourth floor inside the Stanley Hotel. Another hotspot for activity is actually underneath the hotel in a cave system. This was used by former staff to navigate the hotel. It is thought that some of the former employees continue to linger here, including that of a former chef. He is thought responsible for the smells of home-baked goods wafting through what is referred to as The Tunnel. This tunnel is also rumored to be the hang out spot for a deceased cat. Many have encountered this grey ghostly feline, which has bright green glowing eyes. 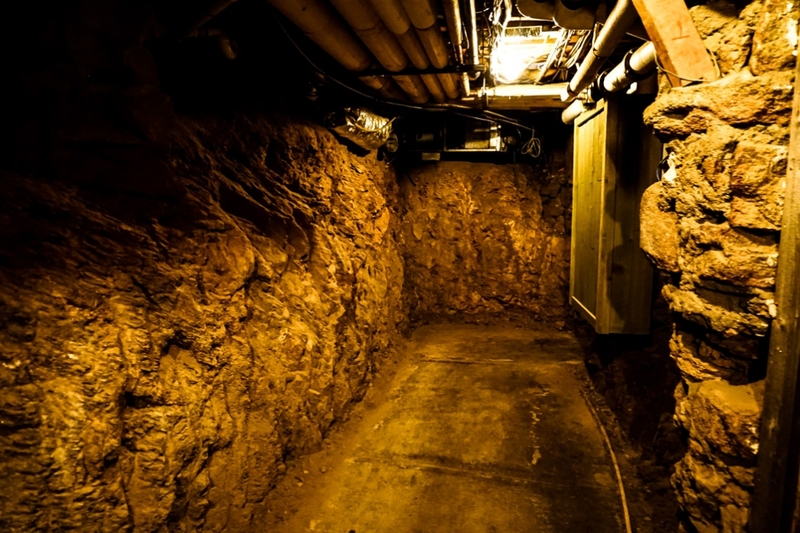 Inside the Stanley Hotel’s haunted underground tunnel system, known as The Tunnel. Said to be the most haunted spot on the Stanley Hotel’s grounds is the Concert Hall. It is thought to be haunted by several spirits. One of these is a former employee named Paul who worked as a handy man in the 1980’s. Paul took great pride in his work and it was no surprise that he returned to his place of work in death. He is thought to communicate with people who have captured EVP’s of a male voice stating ‘get out.’ He also has his own room in the basement level of the Concert Hall, where he usually interacts with male guests. Outside of the Concert Hall, the most haunted building which is part of the Stanley Hotel. Just across from Paul’s room is another, also occupied by a ghostly resident. This spirit is known as Lucy. She is rumored to have been a homeless woman who died in this spot from exposure to the cold, yet her origin is truly unknown. 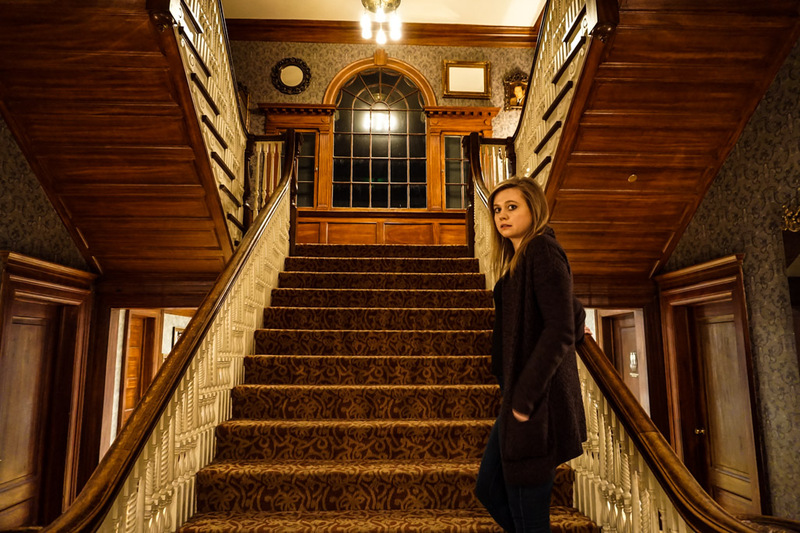 She apparently communicates with paranormal enthusiasts visiting the Stanley Hotel and has befriended some of the young children spirits, who also frequent her room. 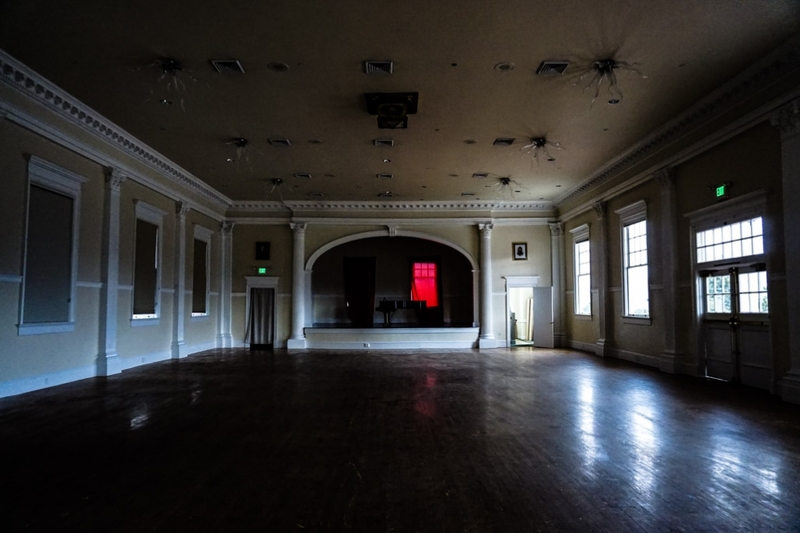 Looking at the main performance stage inside the Stanley Hotel’s haunted Concert Hall. Strangely, the Stanley Hotel also contains an object, not original to the hotel, but supposedly extremely haunted. This object is stored in the basement of the Concert Hall and referred to as the ‘Creepy Mirror’ by tour guides. It is quite an old antique piece, being older than the Stanley Hotel itself, yet its origins are not known. It is thought that this mirror contains some sort of energy trapped within it. Many guests over the years have captured figures and apparitions standing next to them when taking photos of their reflection in the mirror. These figures are creepily not apparent to the naked eye. 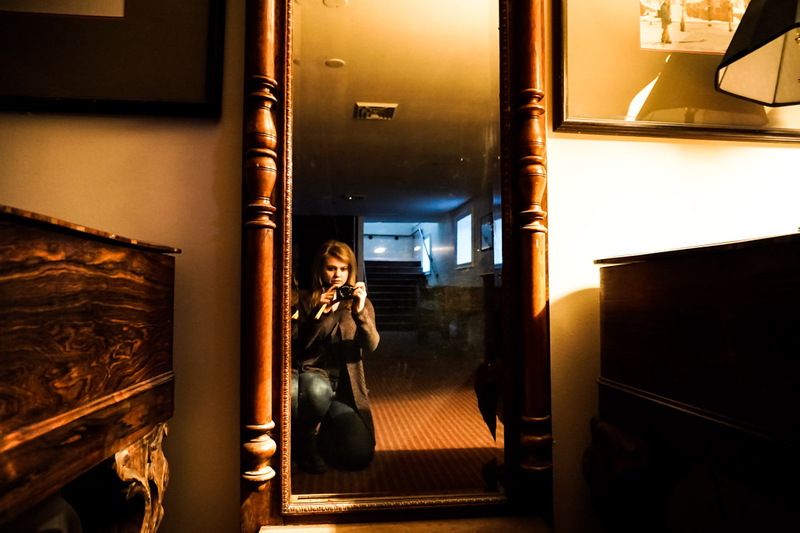 Looking into the creepy, haunted mirror inside the basement of the Stanley Hotel’s Concert Hall. The Stanley Hotel has been immortalized as one of the most haunted places in the world. For anyone with an interest in the paranormal or a connection to horror films or fiction, the Stanley Hotel is a must visit. During my stay I was able to book Room 217! Make sure to request ahead of time to grab this room. Special requests for it can only be made over the phone. It is a little on the pricier side, yet was worth the cost for me to be able to tick that off my bucket list. Be prepared to have tour groups and visitors looking for a Room 217 selfie drop by at all hours of your stay. I was able to have some fun with this by banging and rattling the door and handle as they approached. You’ll be able to watch their scared reactions through the peep hole of the door. Lounge area inside of Room 217 at the Stanley Hotel. During my night inside Room 217 I was able to gain an intelligent response through my Spirit Box and heard some taps on the wall during the early hours of the morning. Let me know in the comments below if you have had your own paranormal experiences inside the Stanley Hotel. Make sure to explore as much of the hotel as possible. The Tunnel and the Concert Hall are only accessible by taking a guided tour. 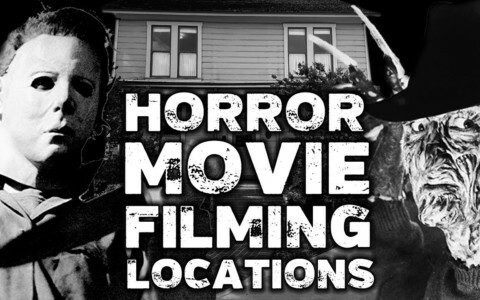 The day time history tour will cover tales including Stephen King. The night time paranormal tour mostly centered on the Concert Hall and The Tunnel. I was surprised not to hear any stories of the upstairs hotel rooms. 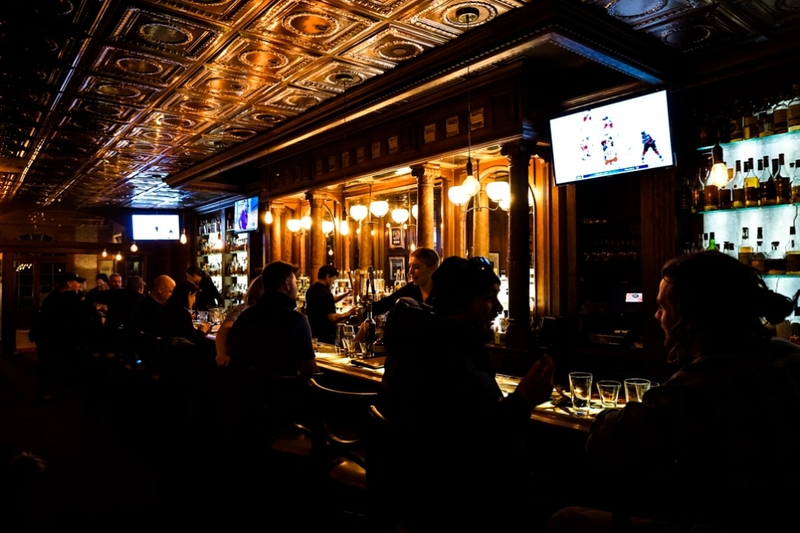 Finally, make sure to check out the amazing bar. You’ll find some delicious eats and some ‘The Shining’ inspired drinks. I tried both the Redrum Punch cocktail and the Redrum Ale, which is locally brewed. Both were great. 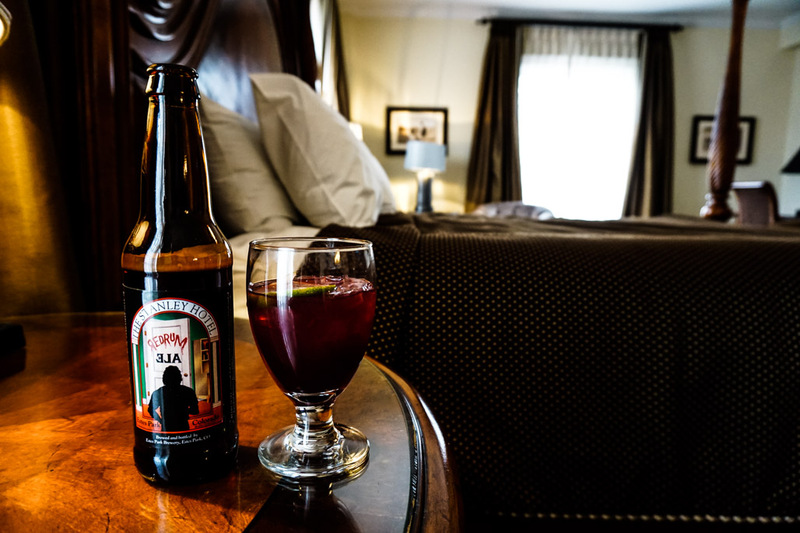 Enjoying a Redrum Ale and Redrum Punch inside of Room 217 at the Stanley Hotel. This has to be one of my favorite places to explore! Looking for more hotels related to The Shining? Check out the Awahnee Hotel in Yosemite, which is also haunted and provided inspiration for the interior sets of The Overlook Hotel in Stanley Kubrick’s film adaption of The Shining.